I shuffled my feet in the snow, watching the small glow of a headlamp move up a wall of ice, illuminating a few round feet at a time in the quiet dark of Hyalite Canyon. I’d never ice climbed before. My sum lifetime experiences with a rope and harness could be counted on half a hand. But there I was, waiting to swap into borrowed boots and crampons, tie in, and try to scale this frozen waterfall. Bozeman Ice Festival. So with the invitation to dip a toe in the water with two friendly faces, before what I imagined to be the clinic’s full-on experience, I felt half-stoked, half-terrified. My first and only pitch that first night was short, unglorious, and completely exhilarating. Sometimes a moment subtly alters life’s course entirely. I can pinpoint it to the second I clicked “add to cart” on that ice climbing clinic four years ago. For the first time, I’d decided to do something just for me. Not because I should, or because of what anyone else thought or wanted, or even because I was sure I’d enjoy it. Ice climbing was wildly outside my comfort zone. It terrified and called to me all at once. It was the baby step into meeting myself, mask off. I didn’t grow up in the outdoors. Even a few years ago, you could call me a total greenhorn. And my winter adventures were limited to ski passes afforded through college-kid discounts, with frequent escapes to the warm lodge for beer and microwaved snacks. Ice climbing seemed so radical, so foreign of a concept that it still surprises me I found the courage to sign up for a clinic, sight unseen and not knowing another soul who’d be there. So one night in December, confirmation email printed and ready, I showed up to a packed, rowdy-sounding Emerson ballroom with a knot in my gut. I was really doing this. The craft brews within arm’s reach served the dual purpose of a distraction and a little liquid courage. Friendly faces behind the registration table found my name on a massive stack of lists, handed me a goodie bag from the festival’s outdoor sponsors, and directed me to the many tables and racks of demo equipment. I had no idea which brands to try, so I picked the shortest lines. An armful of sharp metal objects and Crayola-colored gear later, I was headed home with nothing left to do but try to sleep. I shouldn’t have worried. Instructors Anna Pfaff and Angela Van Wiemeersch imparted wisdom, safety, and stoke to our little group of beginner ladies. The foreign nature of the sport felt accessible, even natural. And while I learned a lot that day, the specifics of technique weren’t that important. It was the way I felt when climbing. The grin that wouldn’t leave my face. The iced-up waterfall, full of life under swings of those unfamiliar tools, my cautious kicks with demo crampons, how everything else melted away except for the unfettered exhilaration of the present moment. In the women’s-only clinics at BIF, ladies climb just as hard as — and maybe harder than — the dudes. But a learning environment by ladies, for ladies, emphasizes mutual support, asking questions, and pushing one’s limits in a positive way. Women get to feel stronger in their own skin as ice climbers, and “keeping up with the boys” never has to enter the conversation. As a result, clinic participants become braver, safer, and more proficient. Picking up the sport of ice climbing in Bozeman, Montana is unique; not all passions are stumbled upon in the midst of world-class community. We can’t all find our surfing mentors among the watermen of Oahu, or learn to play music from legends at Juilliard, but the Bozeman Ice Festival carries the torch of epicness pretty handily. Entering its 22nd season, what began as two local gear demos hosted by the late, great Northern Lights Trading Co. and Barrel Mountaineering, now draws recognition as one of the world’s best ice climbing events. 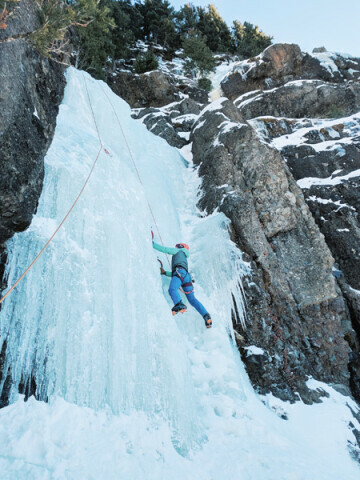 Benefiting from the vision and grassroots elbow grease of legends like Jack Tackle, Joe Josephson, and Barry Blanchard, the Bozeman Ice Festival gives beginners the chance to learn from prominent athletes, and experienced climbers the opportunity to climb with their heroes. The sport might seem inaccessible, daring, and alien to the layperson, but BIF’s clinics pull back the curtain on ice climbing for people like myself. A sense of community and shared excitement connects participants, regardless of one’s level of experience. As beginners climb alongside elites, the vibe is one of shared stoke. The magic, meditative, very real world which Ice fest first opened has kept calling me back, through more climbing, and backcountry skiing, and trail running, and backpacking. 2018 will be my fourth year as a clinic participant and second as a volunteer. Last season, I got my own rope and a few screws. I’m not a skilled ice climber, or a bold one, just enthusiastic, and grateful for every small adventure. Since meeting the mountains that first time, four years ago, I’ve also met myself. Everyone “finds themselves” in different ways. But my ongoing journey of self-discovery has been set in the mountains. Spending less time contemplating inward, more time looking outward and upward. And it started with that clinic, four years ago. Ice climbing, like other outdoor pursuits, asks us to release our grip on internal fears and use that strength instead for the task at hand. The mountains invite us to let go of worthless worry and focus on the now, the tangible, the needful. Out there, joy comes easier, expanding into the vastness of valleys and high peaks. The mind gets quiet. There’s magic that happens when we stop searching and start being. Swing, kick, kick. 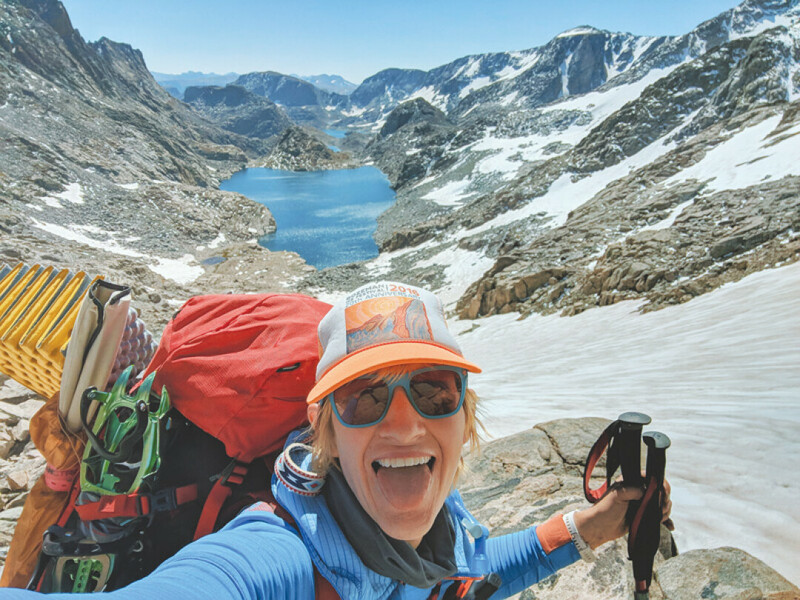 Lauren Burgess pursues adventure, inspiration, and a deeper sense of self in the mountains. She can be found inside at headwalldigital.com, connecting brands that matter with people that care, or outside, hoping she brought enough snacks / took the right trail / remembered her headlamp this time.